This article is about the capital city. For the division, see Dhaka division. For the district, see Dhaka district. For the region of Bangladesh, see Greater Dhaka. For the historic city, see Old Dhaka. For Senegal capital, see Dakar. For other uses, see Dhaka (disambiguation). Hazrat Shahjalal International Airport, Curzon Hall. Dhaka ( /ˈdɑːkə/ DAH-kə or /ˈdækə/ DAK-ə; Bengali : ঢাকা, pronounced [ɖʱaka] ), formerly known as Dacca,  is the capital and largest city of Bangladesh. It is one of the largest and most densely populated cities in the world,   with a population of 18.89 million people in the Greater Dhaka Area. Dhaka is the economic, political and cultural center of Bangladesh. It is one of the major and one of the biggest cities of South Asia, the largest city in Eastern South Asia and among the Bay of Bengal countries; and one of the largest cities among OIC countries. As part of the Bengal plain, the city is bounded by the Buriganga River, Turag River, Dhaleshwari River and Shitalakshya River. The city is located in an eponymous district and division. Bengali, also known by its endonym Bangla, is an Indo-Aryan language primarily spoken by the Bengalis in South Asia. It is the official and most widely spoken language of Bangladesh and second most widely spoken of the 22 scheduled languages of India, behind Hindi. In 2015, 160 million speakers were reported for Bangladesh, and the 2011 Indian census counted another 100 million. 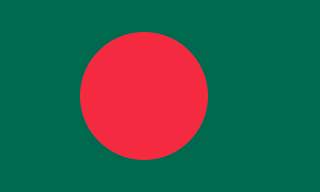 Bangladesh, officially the People's Republic of Bangladesh, is a sovereign country in South Asia. It shares land borders with India and Myanmar (Burma). The country's maritime territory in the Bay of Bengal is roughly equal to the size of its land area. Bangladesh is the world's eighth most populous country as well as its most densely-populated, to the exclusion of small island nations and city-states. Dhaka is its capital and largest city, followed by Chittagong, which has the country's largest port. Bangladesh forms the largest and easternmost part of the Bengal region. Bangladeshis include people from a range of ethnic groups and religions. Bengalis, who speak the official Bengali language, make up 98% of the population. The politically dominant Bengali Muslims make the nation the world's third largest Muslim-majority country. Islam is the official religion of Bangladesh. The Mughal Empire or Mogul Empire was an empire in the Indian subcontinent, founded in 1526. It was established and ruled by the Timurid dynasty, with Turco-Mongol Chagatai roots from Central Asia, claiming direct descent from both Genghis Khan and Timur, and with significant Indian Rajput and Persian ancestry through marriage alliances; the first two Mughal emperors had both parents of Central Asian ancestry, while successive emperors were of predominantly Persian and some Rajput ancestry. The dynasty was Indo-Persian in culture, combining Persianate culture with local Indian cultural influences visible in its court culture and administrative customs. Muslin, a cotton fabric of plain weave, was hand woven in the region around Dhaka, Bengal, and exported to Europe, the Middle East, and other markets, for much of the 17th and 18th centuries. Since its establishment as a modern capital city, the population, area, and social and economic diversity of Dhaka have grown tremendously. Dhaka is now one of the most densely industrialized regions in the country. By the 21st century, it emerged as a megacity, which is now listed as a Beta- Global City by the Globalization and World Cities Research Network (GaWC). Dhaka is a major financial center in the region, being home to many local and international companies. Its stock exchange has over 750 listed companies. The city hosts over 50 diplomatic missions and the headquarters of BIMSTEC. The city's culture is known for its cycle-rickshaws, cuisine, art festivals and religious diversity. The old city is home to around 2000 buildings from the Mughal and British periods, including notable structures such as the Bara Katra and Choto Katra caravansaries. The city's modernist national assembly is one of the largest parliaments in the world. A megacity is a very large city metropolitan area, typically with a population of more than 10 million people. Precise definitions vary: the United Nations Department of Economic and Social Affairs in its 2014 "World Urbanization Prospects" report counted urban agglomerations having over 10 million inhabitants. A University of Bonn report held that they are "usually defined as metropolitan areas with a total population of 10 million or more people". Others list cities satisfying criteria of either 5 or 8 million and also have a population density of 2,000 per square kilometre. A megacity can be a single metropolitan area or two or more metropolitan areas that converge due to close proximity. The terms conurbation, metropolis, and metroplex are also applied to the latter. A global city, also called world city or sometimes alpha city or world center, is a city which is a primary node in the global economic network. The concept comes from geography and urban studies, and the idea that globalization is created, facilitated, and enacted in strategic geographic locales according to a hierarchy of importance to the operation of the global system of finance and trade. The Globalization and World Cities Research Network, commonly abbreviated to GaWC, is a think tank that studies the relationships between world cities in the context of globalization. It is based in the geography department of Loughborough University in Leicestershire, England, United Kingdom. GaWC was founded by Peter J. Taylor in 1998, Together with Jon Beaverstock and Richard G. Smith, they create the GaWC's bi-annual categorization of world cities into "Alpha", "Beta" and "Gamma" tiers, based upon their international connectedness. A membranophone is any musical instrument which produces sound primarily by way of a vibrating stretched membrane. It is one of the four main divisions of instruments in the original Hornbostel-Sachs scheme of musical instrument classification. The dhak is a huge membranophone instrument from South Asia. The shapes differ from the almost cylindrical to the barrel. The manner of stretching the hide over the mouths and lacing also varies. It suspended from the neck, tied to the waist and kept on the lap or the ground, and usually played with wooden sticks. The left side is coated to give it a heavier sound. Subahdar was one of the designations of a governor of a Subah (province) during the Mughal era of India who was alternately designated as Sahib-i-Subah or Nazim. The word, Subahdar is of Persian origin. The Prakrits are any of several Middle Indo-Aryan languages formerly used in India. 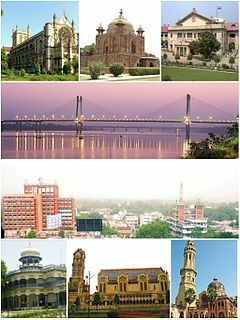 Allahabad, officially known as Prayagraj, and also known as Illahabad and Prayag, is a city in the Indian state of Uttar Pradesh. It is the administrative headquarters of Allahabad district—the most populous district in the state and 13th most populous district in India—and the Allahabad division. Samudragupta was a ruler of the Gupta Empire of present-day India. As a son of the Gupta emperor Chandragupta I and the Licchavi princess Kumaradevi, he greatly expanded his dynasty's political power. The history of urban settlement in the area of modern-day Dhaka dates to the first millennium. The region was part of the ancient district of Bikrampur, which was ruled by the Sena dynasty. Under Islamic rule, it became part of the historic district of Sonargaon, the regional administrative hub of the Delhi and the Bengal Sultanates. The Grand Trunk Road passed through the region, connecting it with North India, Central Asia and the southeastern port city of Chittagong. Bikrampur was a pargana situated 12 miles (19 km) south of Dhaka, the modern capital city of Bangladesh. In the present day it is known as Munshiganj District of Bangladesh. It is a historic region in Bengal. It was a part of the Bhawal Estate. The Sena Empire was a Hindu dynasty during the Late Classical period on the Indian subcontinent, that ruled from Bengal through the 11th and 12th centuries. The empire at its peak covered much of the north-eastern region of the Indian subcontinent. The rulers of the Sena Dynasty traced their origin to the south Indian region of Karnataka. Sonargaon was a historic administrative, commercial and maritime centre in Bengal. Situated in the centre of East Bengal, it was the seat of the medieval Muslim rulers and governors of eastern Bengal. Sonargaon was described by numerous historic travellers, including Ibn Battuta, Ma Huan, Niccolò de' Conti and Ralph Fitch, as a thriving centre of trade and commerce. The Mughal Empire governed the region during the early modern period. Under Mughal rule, the Old City of Dhaka grew on the banks of the Buriganga River. Dhaka was proclaimed the capital of Mughal Bengal in 1608. Islam Khan Chishti was the first administrator of the city. Khan named it "Jahangirabad" (City of Jahangir) in honour of the Emperor Jahangir. The name was dropped soon after the English conquered. The main expansion of the city took place under Mughal governor Shaista Khan. The city then measured 19 by 13 kilometres (11.8 by 8.1 mi), with a population of nearly one million. Dhaka was one of the largest and most prosperous cities in South Asia. It grew into a regional economic center during the 17th and 18th centuries, serving as a hub for Eurasian traders, including Bengalis, Marwaris, Kashmiris, Gujaratis, Armenians, Arabs, Persians, Greeks, Dutch, French, English and the Portuguese. The city was a center of the worldwide muslin, cotton and jute industries, with 80,000 skilled weavers. Mughal Bengal generated 50% of the Mughal Empire's GDP, which at the time constituted 29% of world GDP. Dhaka was the commercial capital of the empire. The city had well-laid out gardens, monuments, mosques, temples, bazaars, churches and caravansaries. The Bara Katra was the largest caravansary. The riverbanks were dotted with tea houses and numerous stately mansions. Eurasian traders built neighborhoods in Farashganj (French Bazaar), Armanitola (Armenian Quarter) and Postogola (Portuguese Quarter). Some of the early educational institutions established during the British period include the Dhaka College, the Dhaka Medical School, the Eden College, St. Gregory's School, the Mohsinia Madrasa, Jagannath College and the Ahsanullah School of Engineering.Ideal School and College was founded on 15 March 1965. Following the inauguration, till 1968 it was a junior school. In 1972 the school was converted into a high school. The students from the school participated in Secondary School Certificate (SSC) examination (O-level equivalent) for the first time in 1973 and earned an extraordinary success for the very first time. Horse racing was a favorite pastime for elite residents in the city's Ramna Race Course beside the Dhaka Club. The Viceroy of India would often dine and entertain with Bengali aristocrats in the city. Automobiles began appearing after the turn of the century. By the early-20th century, Dhaka projected itself as the standard bearer of Muslim minorities in British India; as opposed to the heavily Hindu-dominated city of Calcutta. During the abortive Partition of Bengal in 1905, Dhaka became the short lived capital of Eastern Bengal and Assam. In 1906, the All India Muslim League was formed at the Ahsan Manzil, during a conference on liberal education hosted by Nawab Sir Khawja Salimullah. Bengal was reunited in 1911. The University of Dhaka was established in 1921 by an Act passed in the Imperial Legislative Council. It started with 3 faculties and 12 departments, covering the subjects of Sanskrit, Bengali, English, Education, History, Arabic, Islamic Studies, Persian, Urdu, Philosophy, Economics, Politics, Physics, Chemistry, Mathematics, and Law. The East Bengal Cinematograph Company produced the first full length silent movies in Dhaka during the 1920s, including Sukumari and The Last Kiss. DEVCO, a subsidiary of the Occtavian Steel Company, began widescale power distribution in 1930. The Tejgaon Airport was constructed during World War II as a base for Allied Forces. The Dhaka Medical College was established in 1946. With the Partition of British India in 1947, Dhaka became the capital of East Bengal (1947-1955) and East Pakistan (1955-1971). It hosted the largest legislature in Pakistan, as East Bengalis compromised the majority of the new state's population. Dhaka's urban population increased dramatically because of Muslim migration from across Bengal and other parts of the subcontinent. Dhaka began to see rapid urban expansion from the 1950s. The East Pakistan Stock Exchange Association was formed on 28 April 1954 and later became the Dhaka Stock Exchange. Orient Airways, founded by the East Pakistani industrialist Mirza Ahmad Ispahani, began the first commercial flight between Dhaka and Karachi on 6 June 1954. The airline later evolved into Pakistan International Airlines. The Dhaka Improvement Trust was established in 1956 to coordinate the city's development. The first master plan for the city was drawn up in 1959. Several countries opened consulates in Dhaka, including the United States, India, the United Kingdom, the Soviet Union and the People's Republic of China. The Southeast Asia Treaty Organization established a research center (now called ICDDR,B) for combating disease in 1960. As early as 1947, there were demands for Dhaka to host the parliament of the federation of Pakistan. Shaista Suhrawardy Ikramullah stated that the country's Constituent Assembly should meet in East Bengal due to the region's large population. In 1962, President Ayub Khan designated Dhaka as the seat of the proposed National Assembly outlined in the 1962 Constitution. The government appointed Louis Kahn and Muzharul Islam to design a capitol complex in Dhaka. The city was declared as the country's legislative capital. The Inter-Continental Hotel of Dhaka, designed by William B. Tabler, opened in 1966 in Ramna. The East Pakistan Helicopter Service connected Dhaka with other regional cities as part of the largest commercial helicopter network in the world. Dhaka was declared the national capital by the Constituent Assembly of Bangladesh in 1972. The post-independence period witnessed rapid growth as Dhaka attracted migrant workers from across rural Bangladesh. 60% of population growth has been due to rural migration. The city endured socialist unrest in the early 1970s, followed by a few years of martial law. The stock exchange and free market were restored in the late 1970s. In the 1980s, Dhaka saw the inauguration of the National Parliament House (which won the Aga Khan Award for Architecture), a new international airport and the Bangladesh National Museum. Bangladesh pioneered the formation of the South Asian Association for Regional Cooperation (SAARC) and hosted its first summit in Dhaka in 1985. A mass uprising in 1990 led to the return of parliamentary democracy. Dhaka has hosted a trilateral summit between India, Pakistan and Bangladesh in 1998;  the summit of the D-8 Organization for Economic Cooperation in 1999 and conferences of the Commonwealth, SAARC, the OIC and United Nations agencies during various years. In the 1990s and 2000s, Dhaka experienced improved economic growth and the emergence of affluent business districts and satellite towns. Between 1990 and 2005, the city's population doubled from 6 million to 12 million. There has been increased foreign investment in the city, particularly in the financial and textile manufacturing sectors. But frequent hartals by political parties have greatly hampered the city's economy. The hartal rate declined since 2014. In some years, the city experienced a widespread flash flood during the monsoon. Dhaka is one of the fastest growing megacities in the world. It is predicted to be one of the world's largest metropolises by 2025, along with Tokyo, Mexico City, Shanghai, Beijing and New York City. Dhaka remains one of the poorest megacities. Most of its population are rural migrants, including climate refugees. Blue-collar workers are often housed in slums. Congestion is one of the most prominent features of modern Dhaka. In 2014, it was reported that only 7% of the city was covered by roads. The first phase of the Dhaka Metro Rail is planned for opening in 2021, coinciding with the golden jubilee of Bangladesh's independence. Dhaka is located in central Bangladesh at 23°42′N90°22′E﻿ / ﻿23.700°N 90.367°E﻿ / 23.700; 90.367 , on the eastern banks of the Buriganga River. The city lies on the lower reaches of the Ganges Delta and covers a total area of 306.38 square kilometres (118.29 sq mi). Tropical vegetation and moist soils characterize the land, which is flat and close to sea level. This leaves Dhaka susceptible to flooding during the monsoon seasons owing to heavy rainfall and cyclones. Dhaka District is bounded by the districts of Gazipur, Tangail, Munshiganj, Rajbari, Narayanganj, Manikganj. There are many parks within Dhaka city, including Ramna Park, Suhrawardy Udyan, Shishu Park, National Botanical Garden, Baldha Garden, Chandrima Uddan, Gulshan Park and Dhaka Zoo. There are lakes within city, such as Crescent lake, Dhanmondi lake, Baridhara-Gulshan lake, Banani lake, Uttara lake and Hatirjheel-Begunbari lake. Hatirjheel-Begunbari, which was once a slum area, has turned into a new place of recreation for city dwellers. Hatirjheel covering 320 acres (129 ha) is transformed into a place of festivity at night but with serenity settling down. However, the parks and the recreation places are often crowded and lacks security and cleanliness aspects, which is yet one of the big issues. Dhaka hosts 54 resident embassies and high commissions and numerous international organizations. Most diplomatic missions are located in Gulshan and Baridhara area of the city. The Agargaon area near Parliament is home to the country offices of the United Nations, the World Bank, the Asian Development Bank and the Islamic Development Bank. In 2011, Dhaka City Corporation was split into two separate corporations – Dhaka North City Corporation and Dhaka South City Corporation for ensuring better civic facilities. These two corporations are headed by two two mayor, who are elected by direct vote of the citizen for a 5-year period. Area within city corporations divided into several wards, which each have an elected commissioner. In total the city has 130 wards and 725 mohallas . 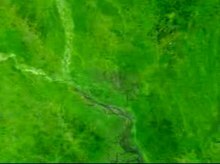 NASA animation showing the urban growth of Dhaka from 1972 to 2001. As the most populous city of Bangladesh, Dhaka has a vibrant cultural life. Annual celebrations for Independence Day (26 March), Language Martyrs' Day (21 February) and Victory Day (16 December) are prominently celebrated across the city. Dhaka's people congregate at the Shaheed Minar and the Jatiyo Smriti Soudho to remember the national heroes of the liberation war. These occasions are observed with public ceremonies and rallies in public grounds. Many schools and colleges organise fairs, festivals and concerts in which citizens from all levels of society participate. Pohela Baishakh , the Bengali New Year, falls annually on 14 April and is popularly celebrated across the city. Large crowds of people gather on the streets of Shahbag, Ramna Park and the campus of the University of Dhaka for celebrations. Pahela Falgun (Bengali : পহেলা ফাল্গুন, first day of Spring of Bengali month Falgun, of the Bengali calendar, also celebrated in the city in a festive manner. This day is marked with colourful celebration and traditionally, women wear yellow saris to celebrate this day. This celebration is also known as Basanta Utsab (Bengali : বসন্ত উৎসব; Spring Festival). Nabanna is a celebration for harvest, usually celebrated with food and dance and music on the 1st day of the month of Agrahayan of Bengali year. Birthdays of Rabindranath Tagore and Kazi Nazrul Islam are observed respectively as Rabindra Jayanti and Nazrul Jayanti. Ekushey Book Fair, which is arranged each year by Bangla Academy and takes place for the whole month of February. This event is dedicated to the martyrs who died on 21 February 1952 in a demonstration calling for the establishment of Bengali as one of the state languages of former East Pakistan. Shakrain Festival (Bengali : সাকরাইন) is an annual celebration observed with the flying of kites. It usually observed in old part of the city at the end of Poush, the ninth month of the Bengali calendar (January 14 or 15 in Gregorian calendar). Islamic festivals of Eid ul-Fitr, Eid ul-Adha, Eid-E-Miladunnabi and Muharram; Hindu festivals of Durga Puja, Buddhist festival of Buddha Purnima; and Christian festival of Christmas witness widespread celebrations across the city. For much of recent history, Dhaka was characterized by roadside markets and small shops that sold a wide variety of goods. Recent years have seen the widespread construction of shopping malls. Two of the largest shopping malls in Dhaka and perhaps in the Indian subcontinent are Jamuna Future Park and Bashundhara City shopping mall. Dhaka is reputed for its unique traditional festivities and food delicacies from way back. It hosts a wide-ranging menu of distinctive dishes many of which were introduced during the regime of Sultani and Mughal Period. Due to different ruling periods, the cuisine of Dhaka is versatile and with a rich culinary tradition. Like other parts of the country, everyday meals generally include plain steamed rice as staple food with fish, meat, vegetable curries and lentil soup is common accompaniment. Plain rice is often replaced by roti or parata. Curry is the most popular style of preparing dishes. Dhaka is home to over 2000 buildings built between the 16th and 19th centuries, which form an integral part of Dhaka's cultural heritage. Such as Binat Bibi Mosque, Lalbagh Fort, Ahsan Manzil, Tara Mosque, Chawk Mosque, Hussaini Dalan, Armenian Church, Curzon Hall, Dhaka Gate, Dhanmondi Shahi Eidgah, Rose Garden Palace, Choto Katra, Bara Katra, Dhakeshwari Temple, Swami Bagh Temple, Ramna Kali Mandir, Holy Rosary Church, Pogose School. There are still many colonial buildings at Dhaka Sadarghat, Armanitola, Farashganj areas of Old Dhaka. Binat Bibi Mosque was built in 1454 at Narinda area of Dhaka during the reign of the Sultan of Bengal, Nasiruddin Mahmud Shah (r. 1435 – 1459),  which is the oldest brick structure that still exists in the city. Important landmark buildings constructed during British rule include Old Highcourt building, Bangabhaban, Curzon Hall and Mitford Hospital. Architect Louis I Kahn's acclaimed modernist National Capital Complex, based on the geography and heritage of Bengal, was inaugurated in Dhaka in 1982 as one of the largest legislative complexes in the world, comprising 200 acres (800,000 m²). Designed by American architect Robert Boughey, Kamalapur railway station is another architectural marvel, which was constructed in the early 1960s and started its operation from 1969. Independence Monument (Bengali : স্বাধীনতা স্তম্ভ) is a new landmark, which was built to commemorate the historical events that took place in the Suhrawardy Udyan during the Liberation War of Bangladesh. There are many museums in the city. Such as Ahsan Manzil, Bangladesh National Museum, Museum of Independence, Liberation War Museum, National Museum of Science and Technology (Bangladesh), Bangabandhu Memorial Museum etc. There are 52 universities in Dhaka. Dhaka College is the oldest institution for higher education in the city and among the earliest established in British India, founded in 1841. Since independence, Dhaka has seen the establishment of numerous public and private colleges and universities that offer undergraduate and graduate degrees as well as a variety of doctoral programmes. University of Dhaka is the oldest public university  in the country which has more than 30,000 students and 1,800 faculty staff. It was established in 1921 being the first university in the region. The university has 23 research centers and 70 departments, faculties and institutes. Eminent seats of higher education include Bangladesh University of Engineering and Technology (BUET), Bangabandhu Sheikh Mujib Medical University (BSMMU), Jagannath University and Sher-e-Bangla Agricultural University. Dhaka Medical College and Sir Salimullah Medical College are two of the best medical colleges in the nation. Founded in 1875, the Dhaka Medical School was the first medical school in Bangladesh (then British East Bengal), which became Sir Salimullah Medical College in 1962. Other government medical colleges are Shaheed Suhrawardy Medical College and Armed Forces Medical College, Dhaka. Alongside public institutes of higher education there are some forty-five private universities in Dhaka. Bangladesh(see:List of universities in Bangladesh), most of which are located in Mohakhali, Gulshan, Banani, Baridhara, Bashundhara, Uttara and Dhanmondi areas of the city. The British Council plays an important role helping students to achieve GCSE and A Level qualifications from examination boards in the United Kingdom. This is in addition to holding several examinations for professional bodies in the United Kingdom, including the UK medical Royal Colleges and Accountancy. Cricket and football are the two most popular sports in Dhaka and across the nation. Teams are fielded in intra-city and national competitions by many schools, colleges and private entities. The Mohammedan Sporting Club and Abahani are two of the most famous football and cricket teams, maintaining a fierce rivalry, especially in the Bangladesh Football Premier League. Dhaka Metropolis cricket team represents Dhaka city in the National Cricket League, a region-based domestic first-class cricket competition in Bangladesh. Dhaka Premier League is the only domestic List A cricket tournament now in Bangladesh. It gained List A status in 2013–14 season. In domestic Twenty20 cricket, Dhaka has a BPL franchise known as Dhaka Dynamites. Dhaka has the distinction of having hosted the first official Test cricket match of the Pakistan cricket team in 1954 against India. The Bangabandhu National Stadium was formerly the main venue for domestic and international cricket matches, but now exclusively hosts football matches. It was used during Pakistan colonial era for Test matches when no Bengalis were selected in team and a matting pitch was used. It hosted the opening ceremony  of the 2011 Cricket World Cup while the Sher-e-Bangla National Cricket Stadium, exclusively used for cricket, hosted 6 matches of the tournament including two quarter-final matches. Dhaka has also hosted the South Asian Games three times, in 1985, 1993 and 2010. Dhaka is the first city to host the games three times. The Bangabandhu National Stadium was the main venue for all three editions. Dhaka also hosted the ICC World Twenty20, along with Chittagong and Sylhet, in 2014. The National Sports Council, responsible for promoting sports activities across the nation, is based in Dhaka. Dhaka also has stadiums largely used for domestic events such as the Bangladesh Army Stadium, the Bir Sherestha Shaheed Shipahi Mostafa Kamal Stadium, the Dhanmondi Cricket Stadium, the Maulana Bhasani Hockey Stadium and the Outer Stadium Ground. The Dhaka University Ground and the BUET Sports Ground host many intercollegiate tournaments. They are also used as practice ground by different football clubs and visiting foreign national football teams. Dhaka is connected to the other parts of the country through highway and railway links. Five of the eight major national highways of Bangladesh start from the city. They are- N1, N2, N3, N5 and N8. Dhaka is also directly connected to two longest routes of Asian Highway Network- AH1 and AH2, as well as to AH41 route. Highway links to the Indian cities of Kolkata, Agartala, Guwahati and Shillong have been established by the Bangladesh Road Transport Corporation (BRTC) and private bus companies which also run regular international bus services to those cities from Dhaka. An elevated expressway system is under construction. The Dhaka Elevated Expressway would run from Shahjalal International Airport-Kuril-Banani-Mohakhali-Tejgaon-Saatrasta-Moghbazar Rail Crossing-Khilgaon-Kamalapur-Golapbagh to Dhaka-Chittagong Highway at Kutubkhali Point. A longer second elevated expressway from Airport-Ashulia is currently undergoing feasibility study. There are 3 inter-district bus terminals in Dhaka, which are located at Mohakhali, Saidabad and Gabtoli area of the city. Kamalapur railway station is the largest and busiest among the railway stations in the city. Designed by American architect Robert Boughey, the railway station situated in the north-east side of Motijheel, was established in the early 1960s and started its operation from 1969. The station is the largest in the country and also one of the most modern and striking buildings in Dhaka. The state-owned Bangladesh Railway provides suburban and national services,  and the Maitree Express international service to Kolkata. Regular express train services connect Dhaka with major cities of Chittagong, Rajshahi, Khulna, Sylhet and Rangpur. Chittagong, officially known as Chattogram, is a major coastal city and financial centre in southeastern Bangladesh. The city has a population of more than 2.5 million while the metropolitan area had a population of 4,009,423 in 2011, making it the second-largest city in the country. It is the capital of an eponymous District and Division. The city is located on the banks of the Karnaphuli River between the Chittagong Hill Tracts and the Bay of Bengal. Sylhet, is a metropolitan city in northeastern Bangladesh. It is the administrative seat of Sylhet Division. The city is located on the right bank of the Surma River in northeastern Bengal. It has a subtropical climate and lush highland terrain. The city has a population of more than half a million. Sylhet is one of Bangladesh's most important spiritual and cultural centres. It is one of the most important cities of Bangladesh, after Dhaka and Chittagong due to its importance to the country's economy. Khulna is the third-largest city of Bangladesh. It is the administrative seat of Khulna District and Khulna Division. As of the 2011 census, the city has a population of 663,342. The encompassing Khulna metro area had an estimated population of 1.022 million as of 2014. Barisal, officially known as Barishal, is a major city that lies on the bank of Kirtankhola river in south-central Bangladesh. It is the largest city and the administrative headquarter of both Barisal district and Barisal Division. It is one of the oldest municipalities and river ports of the country. Barisal municipality was established in the year 1876 during the British Raj and upgraded to City Corporation on 25 July 2002. The city consists of 30 wards and 50 mahallas with a population of 328,278 according to the 2011 national census. The area of the city is 58 km². Bengalis, also rendered as the Bengali people, Bangalis and Bangalees, are an Indo-Aryan ethnic group native to the Bengal region in South Asia, specifically in the eastern part of the Indian subcontinent, presently divided between Bangladesh and the Indian states of West Bengal, Tripura, Assam's Barak Valley, who speak Bengali, a language from the Indo-Aryan language family. The term "Bangalee" is also used to denote people of Bangladesh as a nation. The Ramna Kali Mandir was a temple in Dhaka begun in the time of the Mughal Empire. It was also known as the "Ramna Kalibari". The temple is dedicated to the Hindu Goddess Kali. Dhaka, formerly spelled as Dacca in English, is the capital and one of the oldest cities of Bangladesh. The history of Dhaka begins with the existence of urbanised settlements in the area that is now Dhaka dating from the 7th century CE. The city area was ruled by the Buddhist kingdom of Kamarupa before passing to the control of the Sena dynasty in the 9th century CE. After the Sena dynasty, Dhaka was successively ruled by the Turkic and Afghan governors descending from the Delhi Sultanate before the arrival of the Mughals in 1608. After Mughals, British ruled the region for over 150 years until the independence of India. In 1947, Dhaka became the capital of the East Bengal province under the Dominion of Pakistan. After the independence of Bangladesh in 1971, Dhaka became the capital of the new state. Shahbag or Shahbagh is a major neighbourhood and a police precinct or thana in Dhaka, the capital and largest city of Bangladesh. It is also a major public transport hub. It is a junction between two contrasting sections of the city—Old Dhaka and New Dhaka—which lie, respectively, to its south and north. Developed in the 17th century during Mughal rule in Bengal, when Old Dhaka was the provincial capital and a centre of the flourishing muslin industry, it came to neglect and decay in early 19th century. In the mid-19th century, the Shahbag area was developed as New Dhaka became a provincial centre of the British Raj, ending a century of decline brought on by the passing of Mughal rule. Ramna is a historic colonial neighborhood in central Dhaka. Once the site of Mughal gardens, it developed into an institutional area during British rule in the late 19th century. It became a focal point for Dhaka's modernization in the 1960s. It was the scene of many tumultuous events that ushered the independence of Bangladesh in 1971. The Culture of Bengal encompasses the Bengal region in the eastern part of the Indian subcontinent, including Bangladesh and the Indian states of West Bengal, Tripura and Assam's Barak Valley, where the Bengali language is the official and primary language. Bengal has a recorded history of 1,400 years. The Bengali people are its dominant ethnolinguistic tribe. The region has been a historical melting point, blending indigenous traditions with cosmopolitan influences from pan-Indian subcontinental empires. Bengal was the richest part of Medieval India and hosted the Indian subcontinent's most advanced political and cultural centers during the British India. Bangladesh's tourist attractions include historical monuments, resorts, beaches, picnic spots, forests and tribal people, wildlife of various species. Activities for tourists include angling, water skiing, river cruising, hiking, rowing, yachting, and sea bathing. The following is a timeline of the history of the city of Dhaka, Bangladesh. Chittagong, the second largest city and main port of Bangladesh, was home to a thriving trading post of the Portuguese Empire in the 16th and 17th centuries. The Portuguese first arrived in Chittagong around 1528 and left in 1666 after the Mughal conquest. It was the first European colonial enclave in the historic region of Bengal. Bengali Muslims are an ethnic, linguistic, and religious population who make up the majority of Bangladesh's citizens and the largest minority in the Indian states of West Bengal and Assam. They are Bengalis who adhere to Islam and speak the Bengali language. They form the largest Bengali and the second largest Muslim ethnic group in the world. Dhaka Gate also known as Mir Jumla's Gate or Ramna Gate is a monument believed to be built by Mir Jumla II and enlisted as one of the oldest Mughal architectures in Dhaka. This gate is considered as one of the integral parts of the history of Dhaka. ↑ Partha Pratim Bhattacharjee; Mahbubur Rahman Khan (7 May 2016). "Govt to double size of Dhaka city area". The Daily Star. ↑ "Dhaka City expands by more than double after inclusion of 16 union councils". bdnews24.com. 9 May 2016. ↑ "Dhaka, Bangladesh Map". National Geographic. Retrieved 6 September 2009. 1 2 "Population & Housing Census-2011" (PDF). Bangladesh Bureau of Statistics. p. 41. Archived from the original (PDF) on 8 December 2015. Retrieved 15 December 2015. 1 2 "District Statistics 2011, Dhaka" (PDF). Bangladesh Bureau of Statistics. December 2013. Archived from the original (PDF) on 24 April 2015. Retrieved 14 May 2015. ↑ "Unesco: Bangladesh literacy rate reaches all-time high of 72.76% in 2016". Dhaka Tribune. BSS. 22 March 2018. ↑ PWC. "Which are the largest city economies in the world and how might this change by 2025?". Archived from the original on 4 May 2011. Retrieved 25 November 2016. ↑ Choguill, C.L. (2012). New Communities for Urban Squatters: Lessons from the Plan That Failed in Dhaka, Bangladesh. Springer Science & Business Media. p. viii. ISBN 978-1-4613-1863-7. ↑ "Sector Assessment (Summary): Urban Transport" (PDF). Asian Development Bank. ↑ "Dhaka Population". World Population Review. 26 October 2018. Retrieved 18 March 2019. ↑ Hough, Michael (1 January 2004). "Cities and Natural Process: A Basis for Sustainability". Psychology Press – via Google Books. ↑ "Dhaka". Britannica. Retrieved 22 February 2019. 1 2 "Dhaka". Encyclopædia Britannica. Retrieved 4 February 2013. ↑ "Islam Khan Chisti". Banglapedia . Retrieved 4 February 2013. 1 2 Chowdhury, A.M. (23 April 2007). "Dhaka". Banglapedia. Retrieved 23 April 2007. 1 2 Mamoon, Muntassir (2010) [First published 1993]. Dhaka: Smiriti Bismiritir Nogori. Anannya. p. 94. ↑ Dhaka City Corporation (5 September 2006). "Pre-Mughal Dhaka (before 1608)". Archived from the original on 10 April 2008. Retrieved 1 December 2015. 1 2 "From Jahangirnagar to Dhaka". Forum. The Daily Star. Archived from the original on 8 February 2015. Retrieved 18 February 2015. ↑ Kraas, Frauke; Aggarwal, Surinder; Coy, Martin; Mertins, Günter, eds. (2013). Megacities: Our Global Urban Future. Springer. p. 60. ISBN 978-90-481-3417-5. ↑ "State of Cities: Urban Governance in Dhaka" (PDF). BRAC University. May 2012. ↑ Shay, Christopher. "Travel – Saving Dhaka's heritage". BBC. Retrieved 18 February 2015. ↑ Colley, Linda (2009). The Ordeal of Elizabeth Marsh: A Woman in World History. Knopf Doubleday Publishing Group. pp. 262–. ISBN 978-0-307-53944-1. 1 2 3 4 "Which India is claiming to have been colonizsed?". The Daily Star (Op-ed). 31 July 2015. ↑ Indrajit Ray (2011). Bengal Industries and the British Industrial Revolution (1757-1857). Routledge. pp. 57, 90, 174. ISBN 978-1-136-82552-1. ↑ Srangio, Sebastian (1 October 2010). "Dhaka: Saving Old Dhaka's Landmarks". The Caravan. Archived from the original on 9 September 2015. ↑ "Rare 1857 reports on Bengal uprisings – The Times of India". The Times of India. ↑ "Dhaka WASA". Dwasa.org.bd. Retrieved 18 February 2015. 1 2 "History of Electricity in Bangladesh | Thcapriciousboy". Tusher.kobiraj.com. 18 July 2013. Archived from the original on 16 February 2015. Retrieved 18 February 2015. ↑ Pakistan Affairs. Information Division, Embassy of Pakistan. 1968. p. 19. ↑ Richards, John. "Calcutta and Dhaka: A tale of two cities" (PDF). Inroads. Retrieved 29 June 2015. ↑ "Sheikh Mujibur Rahman". Virtual Bangladesh. Retrieved 18 February 2015. ↑ "The Pearson General Knowledge Manual 2012 – Edgar Thorpe". 23 March 1971. Retrieved 18 February 2015. 1 2 "Centuries of Genocide: Essays and Eyewitness Accounts" . Retrieved 18 February 2015. ↑ "Science, Technology, Imperialism, and War" . Retrieved 18 February 2015. ↑ "Fall of Dhaka: Memories of a bloody December – Pakistan". Dawn. Pakistan. Retrieved 18 February 2015. ↑ Salik, Siddiq (1997). Witness to Surrender. ISBN 984-05-1374-5. ↑ Hossain, Shahadat (January 2008). "Rapid Urban Growth and Poverty in Dhaka City" (PDF). Bangladesh e-Journal of Sociology. 5 (1). ↑ "Dhaka, Bangladesh: Fastest Growing City in the World". CBS News. Retrieved 22 February 2019. ↑ "Welcome to the Traffic Capital of the World". The New Republic. Retrieved 22 February 2019. ↑ Hough, Michael (2004). Cities and natural process. Routledge. pp. 64–65. ISBN 0-415-29855-5. 1 2 "Weatherbase: Historical Weather for Dhaka, Bangladesh". weatherbase.com. Retrieved 15 December 2008. 1 2 Mondal, M. Abdul Latif (27 September 2006). "Our Cities: 15th Anniversary Special". The Daily Star. Archived from the original on 2 March 2007. Retrieved 27 September 2006. ↑ Sohara Mehroze Shachi (5 September 2018). "Bangladesh's Air Pollution Problem Grows, Brick by Brick". Undark. Retrieved 7 September 2018. The kiln operations alone — while representing just 1 percent of the country's GDP — generate nearly 60 percent of the particulate pollution in Dhaka, according to Bangladesh’s Department of Environment (DOE). ↑ "Climate of Bangladesh" (PDF). Bangladesh Meteorological Department. pp. 19–23. Archived from the original (PDF) on 24 December 2018. Retrieved 24 December 2018. ↑ "Normal Monthly Rainy Day" (PDF). Bangladesh Meteorological Department. Archived from the original on 9 July 2017. Retrieved 26 April 2018. ↑ "Normal Monthly Humidity" (PDF). Bangladesh Meteorological Department. Archived from the original on 24 December 2018. Retrieved 26 April 2018. ↑ "Bangladesh – Dacca" (PDF) (in Spanish). Centro de Investigaciones Fitosociológicas. Retrieved 23 February 2013. ↑ "Station 41923 Dhaka". Global station data 1961–1990—Sunshine Duration. Deutscher Wetterdienst. Retrieved 26 April 2018. 1 2 3 "List of Ministries and Divisions". cabinet.gov.bd. 20 November 2016. Retrieved 27 November 2016. ↑ "Navy Bases". Bangladesh Navy. Retrieved 30 January 2017. ↑ joinbangladeshairforce.mil.bd. "Locations of Bangladesh Air Force Bases". joinbangladeshairforce.mil.bd. Archived from the original on 19 January 2017. Retrieved 30 January 2017. ↑ Md Shahnawaz Khan Chandan (8 May 2015). "Reminiscing Dhaka's Legacy". Star Weekend Magazine. The Daily Star. ↑ "Mayor Hanif's death anniversary today". The Daily Star . 28 November 2010. Retrieved 12 February 2015. ↑ "Don't split Dhaka, Khoka urges govt". UNBConnect. 12 November 2011. Archived from the original on 5 April 2012. Retrieved 12 September 2012. ↑ Hasan Jahid Tusher (18 October 2011). "Dhaka set to split into two". The Daily Star. Retrieved 12 February 2015. ↑ Islam, Md Asraful. "Rajdhani Unnayan Kartripakkha". Banglapedia. Retrieved 26 July 2015. ↑ "History of the DMP". Dhaka Metropolitan Police. Archived from the original on 19 October 2013. Retrieved 18 October 2013. ↑ "DMP – New Initiatives". Dhaka Metropolitan Police. Archived from the original on 16 September 2010. Retrieved 30 September 2008. ↑ "What should we do for better civic services". The Daily Star. 23 January 2016. Retrieved 18 June 2016. ↑ "Dhaka City State of Environment" (PDF). Regional Resource Center for Asia and the Pacific, United Nations Environment Programme. 2005. Archived from the original (pdf) on 7 February 2009. Retrieved 24 January 2009. 1 2 3 4 Lawson, Alistair (1 June 2002). "Good times for bourgeois Bangladeshis". BBC News. Retrieved 2 October 2006. 1 2 3 4 5 6 McGee, Terry (27 September 2006). "Urbanization Takes on New Dimensions in Asia's Population Giants". Population Reference Bureau. Archived from the original on 14 February 2008. Retrieved 27 September 2006. 1 2 "Does Dhaka need rickshaws?". BBC News. 20 July 1998. Retrieved 27 September 2006. ↑ Robert Cervero (2000). Informal Transport in the Developing World. UN-HABITAT. p. 39. ISBN 92-1-131453-4. ↑ Dhaka City Corporation. "Dhaka City at a Glance". Archived from the original on 15 January 2013. Retrieved 1 December 2015. ↑ "Town planning for Bangladesh: Vision 2020". The Daily Star. 8 November 2008. Retrieved 15 December 2008. ↑ "Poverty Alleviation: Yunus calls for major reforms in World Bank". The Daily Star. 5 November 2007. ↑ "Blind eye to urban poor to spell social disaster:Conference on the poor told". The Daily Star. 5 December 2007. ↑ "Evolving Urban Form: Dhaka". Newgeography.com. Retrieved 26 June 2013. ↑ "Planet of Slums by Mike Davis". Asia Times. 20 May 2006. Retrieved 8 May 2010. ↑ "Statistical Yearbook of Bangladesh 2012, Page 35" (PDF). Bangladesh Bureau of Statistics. Archived from the original (PDF) on 7 August 2015. Retrieved 14 May 2015. ↑ "Govt ready to offer nationality to Urdu-speaking people: Moni". The Financial Express. Dhaka. Archived from the original on 4 November 2011. Retrieved 12 April 2011. ↑ "Socio-economic Problems of the Urdu Speaking Residents at Mohammadpur" (PDF). Democracy Watch. Retrieved 12 April 2011. ↑ Persoob, Tasmia. "The Forgotten Community: Camp Based Urdu Speaking People in Bangladesh" (PDF). Jahangirnagar University. Archived from the original (PDF) on 22 March 2012. Retrieved 12 April 2011. ↑ "::Our Cities::15th Anniversary Special". The Daily Star. Archived from the original on 2 March 2007. Retrieved 8 May 2010. ↑ Sanghamitra Saha (2001). A Linguist Visits Bangladesh: A Travelogue‎. International School of Dravidian Linguistics. p. 8. ISBN 8185692300. ↑ "Population Census 2011: Dhaka Table C-13" (PDF). Bangladesh Bureau of Statistics. Archived from the original (PDF) on 13 November 2014. Retrieved 11 July 2014. 1 2 Ahmed, Dr. Nizamuddin (27 September 2006). "Happy 400th anniversary, Dhaka!". The Daily Star. Archived from the original on 2 March 2007. Retrieved 27 September 2006. ↑ "Pohela Falgun celebrated". The Daily Star. 14 February 2011. ↑ "Shakrain festival". The Daily Star . 19 January 2011. Retrieved 14 January 2019. ↑ Roy, Tirthankar (2007). "Out of Tradition: Master Artisans and Economic Change in Colonial India". The Journal of Asian Studies. Cambridge University Press. 66: 963–991. doi:10.1017/s002191180700126x. ↑ Thomas Angotti & Lothar Beckel (2001). Mega Cities. GEOSPACE Beckel Satellitenb. p. 730. ISBN 3-85313-051-8. ↑ Alison Arnold (1999). The Garland Encyclopedia of World Music: The Indian Subcontinent. Routledge. pp. 858–859. ISBN 0-8240-4946-2. ↑ Ian Herbert & Nicole Leclercq (2000). The World of Theatre. Taylor & Francis. p. 12. ISBN 0-415-23866-8. ↑ Jeremy Seabrook (1996). In the Cities of the South: Scenes from a Developing World. Verso Books. p. 221. ISBN 1-85984-081-7. ↑ World and Its Peoples. Marshall Cavendish Corporation. 2008. p. 489. ISBN 0-7614-7631-8. ↑ "Treasures of Bangladeshi cuisine". The Daily Star. 24 February 2017. Retrieved 1 March 2017. ↑ Melvin Ember, Carol R. Ember (2002). Encyclopedia of Urban Cultures : Cayenne-Kyoto: Cities and Cultures Around the World. Grolier. p. 147. ISBN 0-7172-5698-7. ↑ "Binat Bibi Mosque". ArchNet Digital Library. Archived from the original on 1 March 2006. Retrieved 18 September 2012. ↑ Ali, Meer Mobashsher; Rouf, Md Abdur (2012). "Jatiya Sangsad Bhaban". In Islam, Sirajul; Jamal, Ahmed A. (eds.). Banglapedia: National Encyclopedia of Bangladesh (Second ed.). Asiatic Society of Bangladesh. ↑ John Simpson (2006). The Traveler's Handbook. Globe Pequot. p. 195. ISBN 0-7627-4090-6. 1 2 3 T. Neville Postlethwaite (1988). The Encyclopedia of Comparative Education and National Systems of Education. Pergamon Press. p. 130. ISBN 0-08-030853-8. ↑ Kamal Siddiqui (1990). "Growth of academic institutions". Social Formation in Dhaka City: A Study in Third World Urban Sociology. Dhaka: University Press Limited. p. 42. ↑ "Dhaka teachers on violence charge". BBC News. 11 December 2007. Retrieved 15 May 2008. ↑ University of Dhaka.03710. (10 September 2006). "Univ. Facts". Archived from the original (PHP) on 4 September 2006. Retrieved 10 September 2006. ↑ Muhammad Shamsul Huq (1983). Higher Education and Employment in Bangladesh. UNESCO. p. 181. ↑ Robert MacHenry, ed. (1993). "Bangladesh". The New Encyclopædia Britannica. Encyclopædia Britannica. p. 717. ISBN 0-85229-571-5. ↑ Al Musabbir Sadi (17 June 2007). "Tasty derby drawn". The Daily Star. ↑ "Revamped Dhaka League ready for kick-off". ESPNcricinfo. Retrieved 30 January 2017. 1 2 "Stadium". ESPNcricinfo. 7 September 2006. Retrieved 26 May 2006. ↑ "Cricket World Cup: Grand ceremony launches tournament". BBC. 17 February 2011. ↑ "ICC Cricket World Cup 2010/11 / Results". ESPNcricinfo. Retrieved 20 June 2011. ↑ "11th South Asian Games to start in January 2010" . Retrieved 21 March 2009. ↑ "Grounds – Bangladesh: Dhaka". ESPNcricinfo. Retrieved 13 March 2008. ↑ Muhammad Abdur Rahim (1981). The History of the University of Dacca. University of Dacca. p. 161. ↑ "Bangladesh Golf Federation Member list". Bangladesh Golf Federation. Retrieved 30 January 2017. ↑ Lawson, Alastair (13 October 2003). "Passengers shun Dhaka-India bus". BBC News. Retrieved 7 September 2006. ↑ "Details of Bus Services". hcidhaka.gov.in. Archived from the original on 2 February 2017. ↑ "No more push for PPP initiative". The Daily Star. 10 June 2011. ↑ "Govt plans to build 2nd expressway". daily-sun. 22 June 2011. ↑ Lawson, Alastair (10 May 2002). "Dhaka's beleaguered rickshaw wallahs". BBC News. Retrieved 17 December 2008. ↑ "rickshaw: Dhaka". Encyclopædia Britannica. Archived from the original on 16 January 2009. Retrieved 17 December 2008. ↑ Cervero, Robert. Informal Transport in the Developing World. Nairobi: UN Habitat. ISBN 9211314534. ↑ Menchetti, Peter (24 March 2005). "Cycle Rickshaws in Dhaka, Bangladesh" (PDF). Thesis for Amsterdam University. Retrieved 15 April 2008. ↑ Lawson, Alastair (5 October 2002). "Dhaka". BBC News. Retrieved 24 February 2009. ↑ Rizanuzzaman Laskar (4 March 2007). "Rickshaw pullers get licences". The Daily Star. ↑ Rahman, Mushfiqur (2003). "Compressed Natural Gas". In Islam, Sirajul (ed.). Banglapedia: National encyclopedia of Bangladesh. Dhaka: Asiatic Society of Bangladesh. ISBN 984-32-0576-6. OCLC 52727562 . Retrieved 17 January 2008. ↑ "Govt to import 5,000 taxis". The Daily Star . 10 May 2013. Retrieved 15 May 2013. ↑ "Uber taxis in Dhaka". The Daily Star (Editorial). 10 May 2013. Retrieved 27 November 2016. ↑ "Cabinet nods guideline draft legalizing Uber, Pathao". Dhaka Tribune . 15 January 2018. Retrieved 11 September 2018. ↑ Alam, Jobair Bin (2003). "Air Transport". In Islam, Sirajul (ed.). Banglapedia: National encyclopedia of Bangladesh. Dhaka: Asiatic Society of Bangladesh. ISBN 984-32-0576-6. OCLC 52727562 . Retrieved 17 January 2008. ↑ Byron, Rejaul Karim (28 August 2010). "New int'l airport to cost Tk 50,000cr". The Daily Star. Retrieved 16 November 2011. ↑ "AIRPORT DEVELOPMENT HISTORY". Civil Aviation Authority, Bangladesh. Retrieved 16 November 2011. ↑ "CAAB initiates efforts to expand and upgrade HSIA To build a new airport for Dhaka". The Bangladesh Monitor. 1 April 2015. Archived from the original on 5 April 2015. Retrieved 21 July 2013. ↑ "Shahjalal airport set for upgrade in two months" . Retrieved 4 June 2015. ↑ "Biman's Destination: International Destinations". Biman Bangladesh Airlines. Archived from the original on 1 July 2013. ↑ "Dhaka – Zia International Airport (DAC)". World Executive. OE Interactive. ↑ Ershad Ahmed. "Dhaka". blogspot.com. Retrieved 18 February 2014. ↑ Marika McAdam (2004). Bangladesh. Lonely Planet. p. 66. ISBN 1-74059-280-8. ↑ "PM inaugurates Dhaka-Narayanganj DEMU train". Bdnews24.com . 24 April 2013. Retrieved 1 May 2013. ↑ "Demu train service introduced on Dhaka-Joydebpur". Dhaka Tribune. 24 April 2013. Archived from the original on 18 December 2016. Retrieved 22 August 2013. ↑ "Muhith to sit with armed forces to resolve metro rail site dispute". The Financial Express. Dhaka. 25 June 2011. Archived from the original on 2 April 2015. ↑ "PM opens work on metro, BRT". The Daily Star. 27 June 2016. Retrieved 25 July 2016. ↑ Economic and Social Commission for Asia and the Pacific. (2005). "Dhaka". Asian Highway Handbook. United Nations Economic and Social Commission for Asia and the Pacific, United Nations Publications. p. 28. ISBN 92-1-120170-5. ↑ "Waterbus service launched on Sadarghat-Gabtali river route". Bangladesh Business News. 28 August 2010. ↑ "Water taxi services on Dhaka's Hatirjheel 'from Victory Day'". bdnews24. 6 December 2016. ↑ "NYC's Partner Cities". The City of New York. Archived from the original on 14 August 2013. Retrieved 26 March 2015. Sharuf Uddin Ahmed, ed. (1991). Dhaka -past present future. The Asiatic Society, Dhaka. ISBN 984-512-335-X. Pryer, Jane (2003). Poverty and Vulnerability in Dhaka Slums: The Urban Livelihood Study. Ashgate Publishing. ISBN 0-7546-1864-1. OCLC 123337526 OCLC 243482310 OCLC 50334244 OCLC 50939515. Taifoor, S.M. (1956). Glimpses of Old Dacca. Dhaka. Wikimedia Commons has media related to Dhaka . 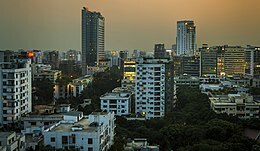 Wikivoyage has a travel guide for Dhaka .